Rudimentary cafe in Footscray is fashioned out of three shipping containers. Does Melbourne have the best cafes in the world? What a question – who's been everywhere, who has even tasted the coffee in every country? But it makes you think about what makes Melbourne cafes so good, and it's an excuse to spend some time investigating. After lounging at communal tables around town, we came up with 11 reasons why we think Melbourne's cafes are the best. 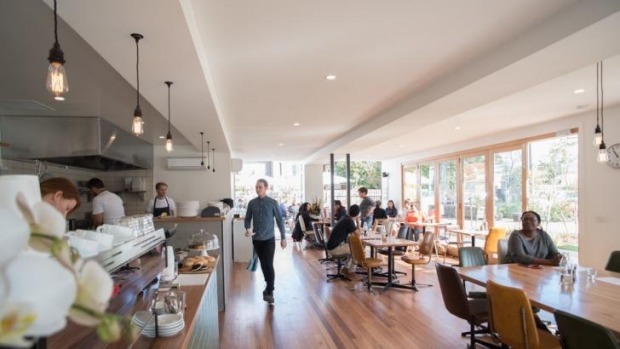 One thing about Melbourne cafes is that there is no template for a "Melbourne cafe": the best are embedded in their neighbourhoods, and take their character from them, in design and food and in the kind of people who hang out in them. So in Collingwood you might find yourself drinking filter coffee in an old shopfront that's been converted (with sledgehammers and paint rollers) into a downbeat brew bar (Everyday Coffee) alongside a tableful of Macbook Air-tappers, or sipping a silky flat white in a red-brick textile mill that's become a destination for cafe-goers, like Proud Mary. South of the Yarra, it could be that back-lane building that became the prototype warehouse cafe (St Ali), or The Kettle Black, which emerges surprisingly from a grand, lacy terrace house with a postmodern apartment block grafted on top. In Brunswick, some young folk with beards and big glasses turn a dead corner shop into a good spot to hang out and drink coffee, and the whole neighbourhood joins in. At A Minor Place, the corner comes alive with benches on the footpath, dogs hitched to the old verandah post and crowds at the tables inside. In Reservoir, another row of dusty shopfronts in a forgotten side street gets an op-shop refit to become Lady Bower Kitchen, while in Kew a brother and sister convert their local milk bar, keeping the homey feel and the lolly jar on the counter, but adding a Synesso and food from a one-page menu of suburban brunch faves at Adeney Milk Bar. Footscray has a new cafe made, appropriately, out of shipping containers planted on a landscaped vacant lot (Rudimentary); Carlton has Brunetti, the last word in New World Mediterranean style, a cafe that never sleeps and where the brass and marble trace the journey of Melbourne's Italians from poorhouse to townhouse; while the CBD is dotted with coffee holes in unlikely places – from station underpasses and switchboard cupboards to office lobbies and the portico behind St Paul's – and it seems there's a smart coffee bar down every one of Melbourne's famous laneways. ...even if sometimes it seems that way. 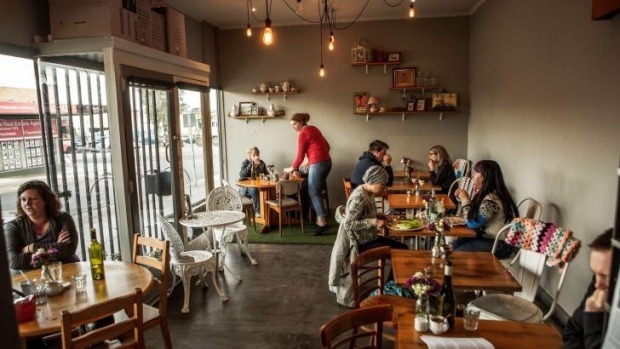 Good cafes are spread through suburbs as diverse as Reservoir (hello again Lady Bower Kitchen) to Mordialloc (Hendriks), Gardenvale (Omar and the Marvellous Coffee Bird), Werribee (Corinthians), Burwood (Foodrinkery) and beyond. Build it and we will come – for good coffee, creative, tasty food and casual but special spaces to enjoy it in. There might be colourful tattoos, big glasses, craft beards and skinny jeans; but not everyone can be pigeonholed by eyewear or facial hair. Research by Roy Morgan earlier this year found that 63 per cent of Melburnians went to cafes to drink coffee – we can't all be hipsters or ladies having lunch. You also see workers swinging corporate lanyards or wrapped in high-vis vests, parents with pushchairs and dog-walkers with poodles, schnoodles and labradoodles. We might be catching up with old friends, indulging in a family ritual, taking preschoolers for a morning stroll, hatching plans for a project, working on a thesis or just whiling away the afternoon. A cafe is a place to do all those things in Melbourne. A big, low table made for lounging close to the ground or a high table with stools to match could be the symbols of early 21st-century Melbourne civilisation. The communal table is one of the important ways our cafes mark themselves as shared public spaces where the only price for taking part is the cost of a cup of coffee. Communal tables help make cafes a place where it's OK to be alone in public, where people respect your existential bubble but also share it. You can bring your laptop or your book-club novel or just yourself. The communal tables in our cafes have no time limit on them. Cafes are remaking Melbourne's public space, and although they are still about consumption, it's local and personal, and the owners are mostly small business people. They are often young, energetic and entrepreneurial, a sign that you can make your way in Melbourne with a good idea and hard work. Cafes give us an enlarged sense of what it means to live in this city, with a connection to community that chain stores and shopping malls can never make. So wrote The New York Times' David Shaftel last year, quoting Julian Casablancas, lead singer of the Strokes as saying: "I don't know how many, like, white people having brunch I can deal with on a Saturday afternoon". while The Guardian called brunch "a symptom of the soulless suburban conformity that is relentlessly colonising our urban environments". In Melbourne, brunch means eating creative food without spending a packet, and menus allow fantastic flexibility. Brunch is a small but tasty indulgence that we should all be allowed, an hour or two catching up with friends, family or just ourselves over coffee and a plate of french toast or smoked salmon and poached eggs or a pulled-pork bun. Brunch is for everyone, and Melbourne cafes do great brunch. When you travel overseas people often ask, "What is Australia's cuisine?" and you reply "barbecues" (too American), "meat pies" (too British), "seafood" (too vague) or "pasta, sushi, pho and…" (multicultural fusion). Maybe we should be saying avocado smash with Vegemite, or a dukkah dusting, or a spritz of lime and coriander is our national dish – just add a poached egg. How about a brioche bun stuffed with pulled pork, bacon and egg, or fresh crayfish? Why not perfect corn fritters (crisp outside, creamy inside)? Australian cuisine could mean Melbourne cafe cuisine: relaxed, casual and democratic food. 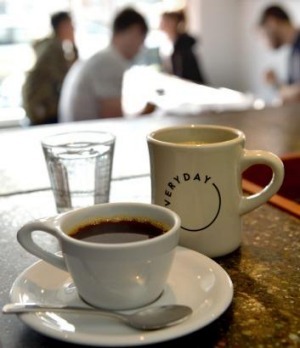 Melbourne's cafes have taken to the batch brewer, and cafe-goers have taken to filter coffee. This is not just an inner-north thing. You'll see people lingering over batch brews at places such as Glovers Station in Elsternwick or Bluff Town in Sandringham. Filter brews match the lighter roasts preferred for specialty-grade beans, letting the flavours shine in ways that espresso doesn't. With easy filter brewing, we get the fruit without the acidity. Filter brews make a great food match, too. Try a cup of Colombian next time you order a Mexican egg breakfast and taste how that hit of chilli brings out something in the coffee you didn't know was there. Melbourne's espresso culture stretches back more than half a century. People say, "It's not like the coffee in Italy," and it's true. Italian taste has stayed pretty static. Italian roasters still add robusta to their espresso blends, and it's inner-tube sweetness gives Italian espresso its distinctive quality. Melbourne prefers 100 per cent arabica, and that's reflected in the flavours here. Melbourne is at the cutting edge of sourcing, roasting and brewing specialty coffee, with filter-style brews and single origin espresso on many cafe menus. We regularly make the list of the world's best coffee cities – on CNN, Huffington Post, Lifehack, BBC Travel – but they're just telling us something we already know. Last year, The New York Times reported on an invasion of Australian-style cafes, pointing out about a dozen places where, if you walked in with a kangaroo and an emu on your passport, you'd feel right at home. The combination of creative, tasty food, great coffee and friendly service is something Americans don't expect from a cafe. It seems that Melbourne's cafes are the template. Brooklyn's Bedford-Stuyvesant neighbourhood is home to a cafe called Brunswick, which The New York Times described as "an Australian cafe" in the way you might say "a French bistro" or "an English pub". 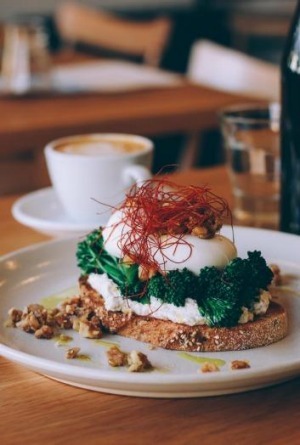 Elsewhere, New Yorkers enjoy avocado toast and flat whites at Bluestone Lane (in Greenwich Village, started by Nick Stone, a former AFL player) and Little Collins (owned by former Melbourne lawyer Leon Unglik) in Lexington Avenue. Something similar is happening in Europe. 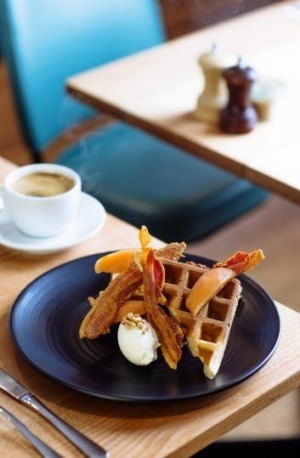 There's a place called Holybelly in Paris (owned by a couple who had stints at Market Lane and the Duchess of Spotswood), as well as a cafe called Tuckshop that has avocado and Vegemite on toast, long blacks and flat whites on the menu. In Milan, a cafe called Pave features recycled armchairs and a big communal table – which Italians took a while to accept, says the owner, Luca Scanni. Pave was inspired by the "lazy breakfasts and lovely spaces" of the cafes Scanni haunted in Fitzroy during two stints as a journalist in Melbourne. Workshop Coffee in London's Clerkenwell district ticks all the Melbourne boxes: bare brick walls, warm timber, and a big coffee roaster up the back. On the shelves at Workshop is a coffee blend called Cult of Done, the legacy of an early association with St Ali. The hip little coffeehouse Prufrock in Holborn, with its classic blue espresso cups, chalkboard menu and brew-bar-meets-science-lab aesthetic, could be in Collingwood. Not even Singapore is immune, with cafes like Common Man Coffee Roasters offering a cafe experience driven by Singapore students returning from Melbourne and Sydney. The Australian cafe is a thing, and Melbourne has the best in the world.